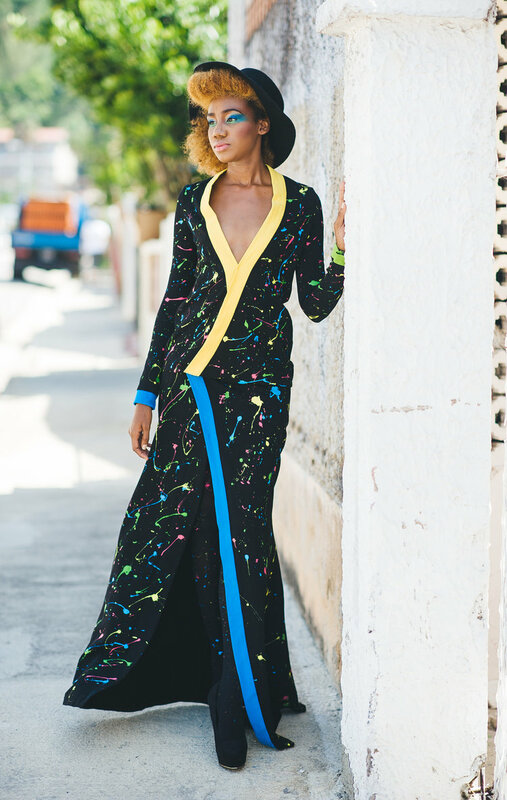 Caribbean Fashion Designer Delia Alleyne paints the town in style with her Let's Paint Spring/Summer '16 Collection. This collection delivers my 3 favorite F's 'Fashion, Flirty & Fun'! The artsy ensemble is perfect for ladies who love festivals and shows such as Art Basel, (here's a cool re-cap if you missed this year's Miami Beach show). The “Let’s Paint” women’s fashion collection created for spring and summer of 2016 offers a splash of colorful contrast against black silhouettes. Fashion Designer, Delia Alleyne introduced the line during the September 2015 Market Week in New York City. The looks include rompers, jackets, funky trousers and that classic little black dress. The “Let’s Paint” collection is splashy, bold and is styled with a retro artist’s cap that makes the collection reminiscent of the psychedelic sixties. The applied fabrics range from nets to denim, to brocades as the paint splatter and appliquéing adds detail and an interesting design element to the collection. Delia, with her distinguished pink hairstyle, has a passion for colorful fashions. 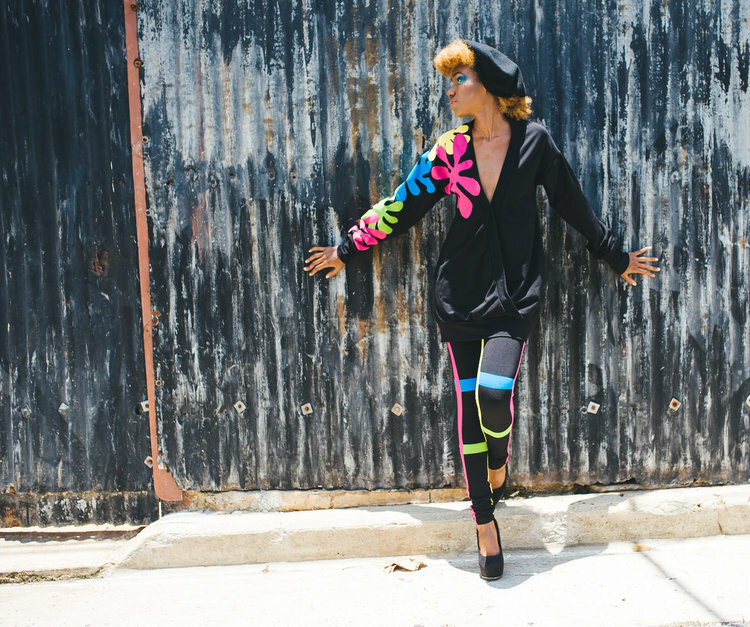 Residing in Trinidad and Tobago, Delia creates fashions tailored towards confident women. Her personal clients are bold about making a grand appearance during special occasions, nightlife hot spots and red carpet showcases. Delia is inspired by the many crafty artists who surround her Caribbean nation. She began her career designing fashion gowns for pageantry. Delia’s tenure at Trinidad’s Caribbean Academy of Fashion and Design school prepared her for a mentorship working on costume design projects with the famed Caribbean couturieres Meiling Esau. Delia strives to bring an avant-garde genre of fashion design into ready-to-wear by applying unique design details, and using finer fabrics. Delia’s goal is for the “Let’s Paint” collection to become a luxuriant lifestyle brand that is recognized throughout the Caribbean.